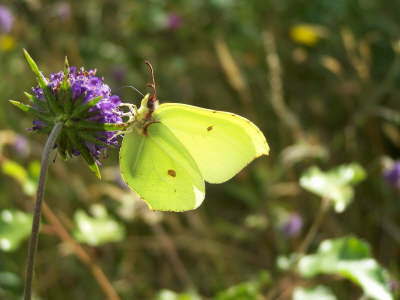 The butterfly larval stage is the growth stage for butterflies and moths. It is a highly sensitive stage highly vulnerable to disease, starvation, predation, infection by parasites and failure to thrive if environmental conditions turn hostile. According to Newland et al. (2015) many adult butterflies live long enough to lay about 50 eggs. Of these, 20-40 might become caterpillars of which perhaps 10 will become chrysalises. Just 1-3 adults will be produced. In these calculations, the highest numerical loss is seen in the larval stage. What do larvae do to avoid being eaten? 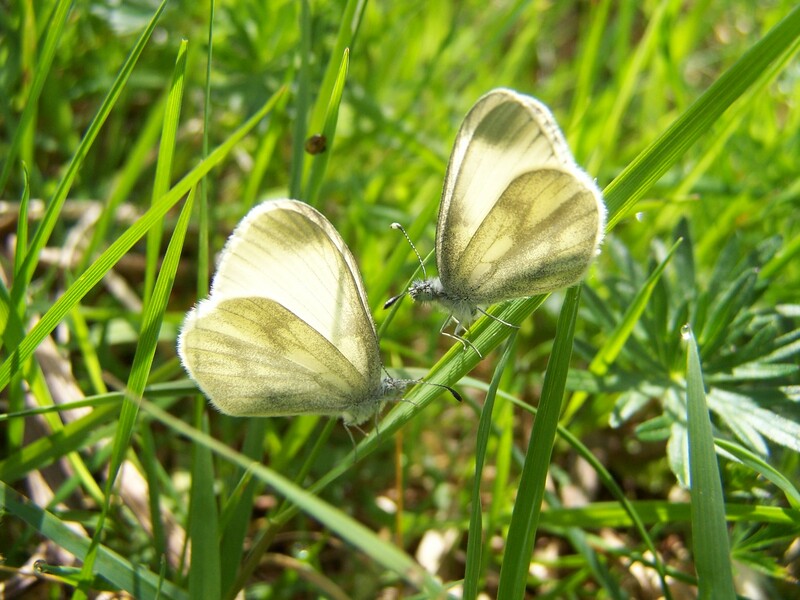 There are essentially two phenotypes (concerning the appearance of an organism arising from the relationship of its genetic makeup with the nature of its environment) used by Ireland’s butterfly larvae. Some butterfly larvae are aposematic. This means that larvae are highly visible to send a warning signal that they are distasteful, toxic or painful to eat. Such larvae do not attempt to hide or blend in with surroundings. These larvae feed openly, often in groups, unconcerned about an attack by birds. 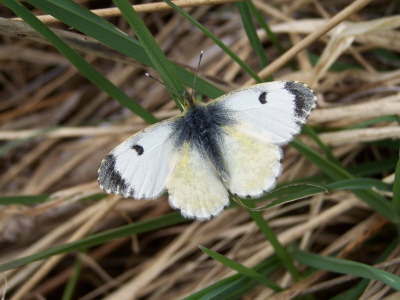 The larvae of the Large White, which are brashly obvious, are black, white and yellow. These are smooth-skinned but their bodies contain caustic mustard oils that will burn the mouth of a predator. There are other aposematic larvae that are highly distasteful and painful to eat. 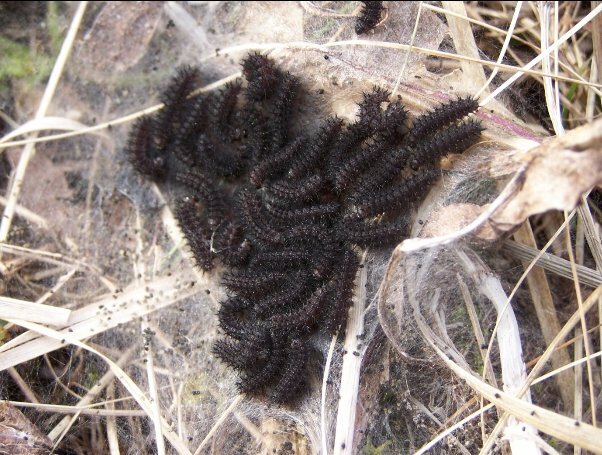 The Marsh Fritillary larvae feed openly, in large groups until their final growth stages. The larvae are spiky, containing bristles and black, standing out when they bask on pale, dry leaf litter. The bristles are highly injurious. If you don’t believe me, try pressing one to your lips. Even doing so gently is quite unpleasant. 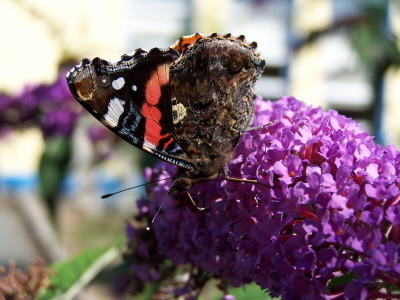 If a bird does grab a spiky Marsh Fritillary, Peacock or Small Tortoiseshell larva, there is a chemical deterrent deployed which involves the larva placing its mouthparts against the bird’s beak and vomiting. The vile liquid (I’ve smelt it but not tasted it-yet!) provokes the bird to drop its prey. If that is not enough, the larva also pushes its spines into the predator, causing it to recoil in pain and drop the larva. Most of these larvae are quite unharmed when dropped and roll into a ball to present a forest of spikes in the event of another attempt on its life. 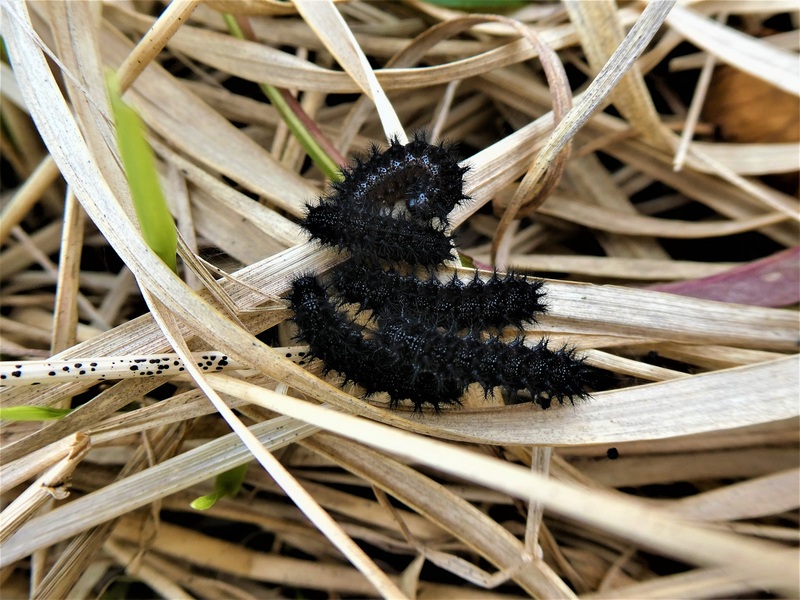 Marsh Fritillary larvae spines and distastefulness mean that it is almost immune to avian attack. © J.Harding. The larvae of other species are cryptic and rely on blending into their surroundings. These larvae are soft-skinned and edible, highly attractive to birds. Their colour often matches the food plant. Their behaviour is usually highly secretive. One example of such a larva is the Purple Hairstreak. 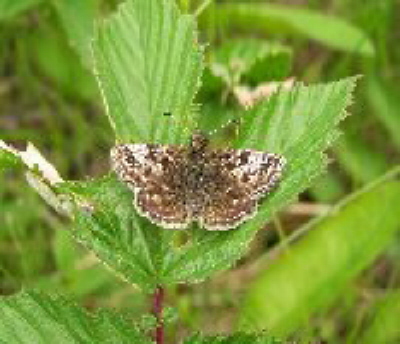 This species feeds on oak leaves and flowers. 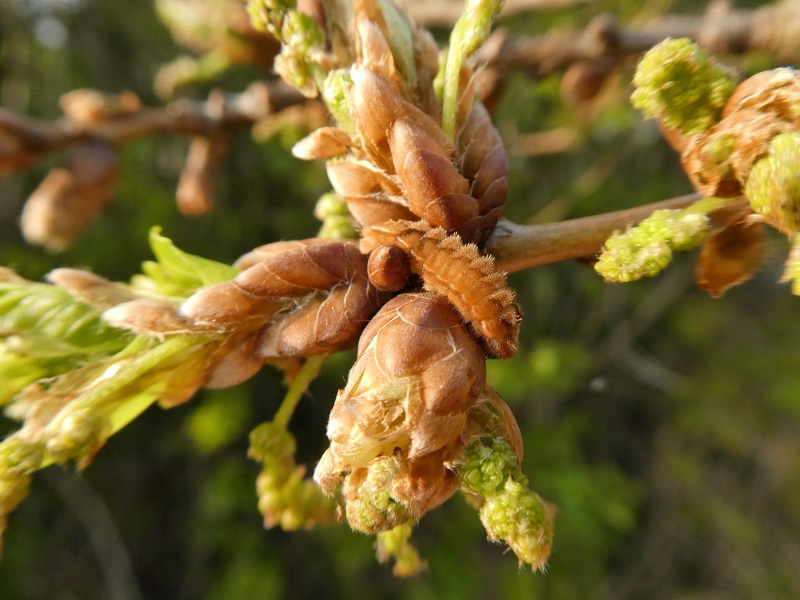 The egg hatches in March and April when the oak buds begin to open. The tiny larva enters the opening buds but when older and the leaves unfurl it must feed openly. During the day it rests at the base on the leaves, on leaf scales which it closely resembles in colour and patterning. In order to continue to blend in with the scales, it spins a loose web around these in case they are shed by the tree, ensuring these are retained. Feeding is now carried out at night when birds are inactive. Another strategy is its remarkably slow movement which avoids drawing attention. When oak leaves are unfurling, small birds scour the trees in search of the myriad larvae that feed on oak leaves. 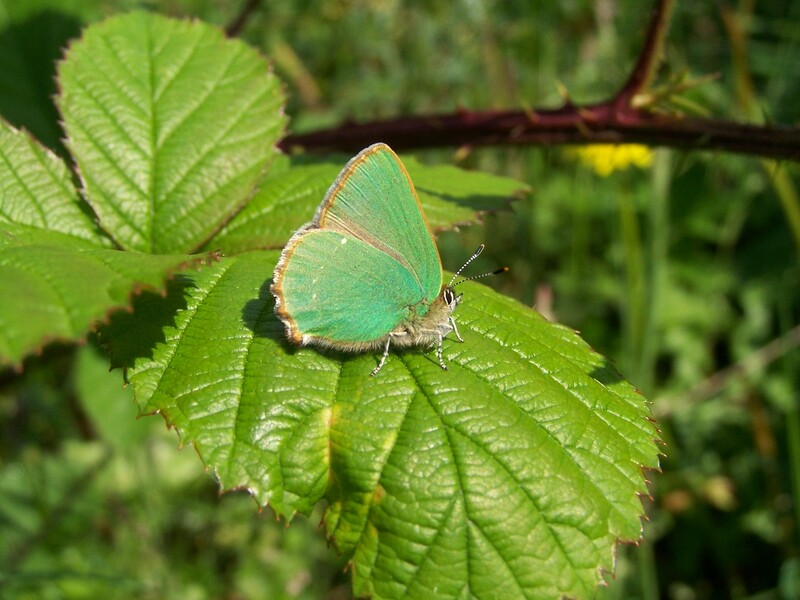 While Purple Hairstreak larvae resting at the base of the leaves are found, the research suggests that about half of the larvae survive on oak leaves with predation greatly increasing after leaving the tree to pupate (Thomas 2010). 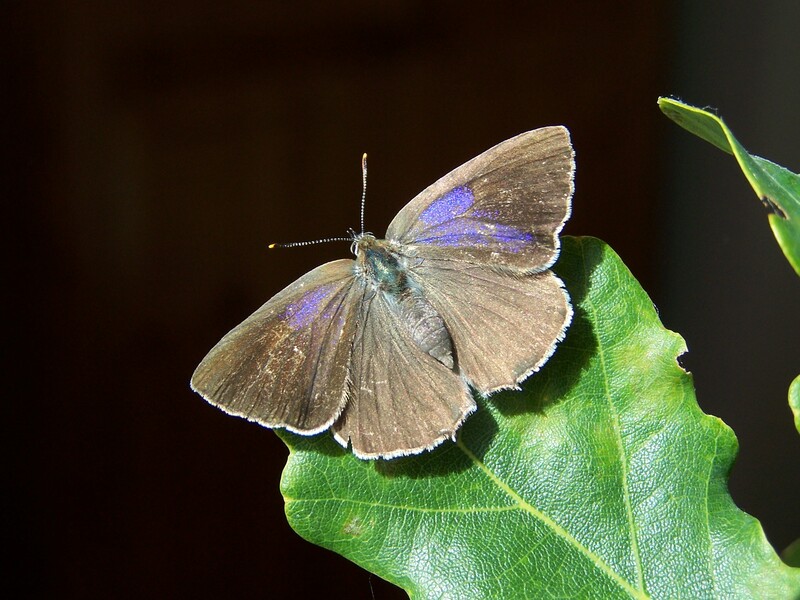 Another strategy used by the larva of the Purple Hairstreak is to play dead if disturbed by a bird. If it is picked up, the larva stays still. A wriggling larva is a clear confirmation that live protein has been found, while a still creature might be a leaf scale or piece of bark. Purple Hairstreak fourth instar larva on leaf scales. © J.Harding. While the strategies described may protect some caterpillars from birds there are many other hazards. Many caterpillars are killed by bad weather, viruses, parasitoids and other predatorial animals, such as wasps. When you see the perfect adult butterfly admire it not just for its beauty but for its achievement in getting this far! 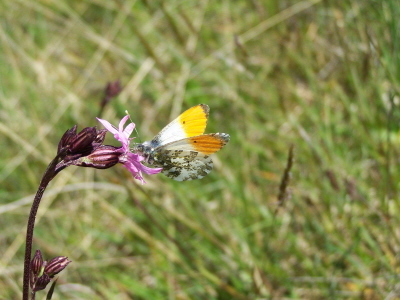 Thomas, J. and Lewington, R. (2010) The Butterflies of Britain and Ireland. (Revised edition) British Wildlife Publishing, Dorset. Newland, D., Still, R., Swash, A. and Tomlinson, D. (2015) Britain’s Butterflies (Third edition) Princeton University Press, New Jersey.